From the outside it looks like a sixties office block of the most boring kind - grey, uniform, concrete - and it sits in the middle of one of the less appealing parts of King's Cross. But windows subtly decorated with a print of weaving green vines hint at something more inviting within. Run by the Shoreditch Trust, Acorn House is a social enterprise formed in a delicious mould. Principles of sustainability, localism and community building shape it, but fine, seasonal food is at its heart. It bills itself as London's first eco-friendly training restaurant. Head through the door and you immediately forget the brutal architecture and raging traffic without. We visited midweek for a luxuriously long lunch - three courses, with wine and coffee. It was like a Christmas treat in terms of daytime overindulgence, although with light summer food and no tinsel. We started with a couple of salads - an oriental feeling one, with nuts and cucumber, and a Mediterranean one with chargrilled aubergine and a creamy dill dressing. Both were simple and tasty. 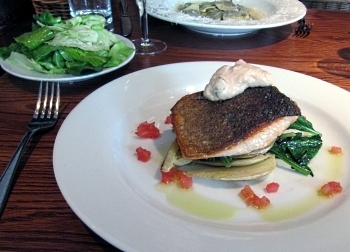 To follow we had trout served on a bed of fennel and spinach with aioli - which got a hearty thumbs up - and mushroom ravioli, freshly homemade and again very simple, but perfect. A side of bright honeyed greens was ordered to share and was also duly devoured. Indulgence really came in the form of an afternoon peach bellini and a heaving Eton mess, packed with summer berries, thick cream and meringue that was tooth achingly sweet. A clean melon sorbet was an excellent palate cleansing antidote, and tasted incredibly like the real thing. The lunch was special enough to pull us back again only a few days later to try it out at night - another indulgent, but relaxed and delicious, experience. The meat and fish eaters seemed especially impressed, but vegetarians are well catered for too. This is eco eating that everyone can enjoy. Acorn House isn’t cheap but the food is of a standard that makes it feel like good value. Its tempting and regularly changing menu makes it impossible to stick to just a main and a glass of wine, so things can add up. If you're feeling poor perhaps it's the place to take your parents or a successful sibling when they're picking up the bill!